You must be happy to see my face, as I don't have the anti-rad suit on that I wore on our first rendez-vous! Good morning ladies and gentlemen! I hope this broadcast finds you well, especially following our last meeting where we savored our chef's spécialité, the infamous Fantastik flavored hallucinogenic ham with Uranium seasoning. Those who survived will certainly acknowledge the merits of this delicatessen when receiving in-laws. I hope you were not too disappointed by the layoff we had to take, since we promised to be back soon and here we are 6 months later. This can be explained by the fact that the staff was within a 5 mile radius of the ham when we cooked it. But don't you worry, we hired some other kamikaze. The UnRecipe series continues this week to take our culinary senses to new heights with a recipe devised by one of my ancestors, Epic Flying Moose, who worked as a chef for fur-traders and lumberjacks in Quebec. 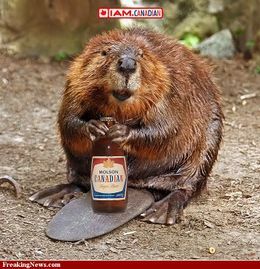 Food was scarce in this harsh era and he perfected the Crunchy Beaver with Pine Gum Coulis to a point where people in the family actually passed it on from generation to generation without even the slightest disgust or feeling of guilt. Without further ado, let's get on our way to get that party going! ↑ A fortuitous bat blow to the skull will do the job nicely. Choose the juiciest-looking one. Maybe the rest of the family will be incensed tough. Watch out for those nasty tree-cutting teeth. ↑ Where there is beavers, there is pine gum. ↑ Amount and color to your discretion, but variety is encouraged, latex isn't off-limits. ↑ Can't have a recipe without it. Of course they didn't have any paint or motor oil back in the days, but let's make the best of both worlds here to tickle our taste buds. A week before your scheduled date for the recipe, put the garlic, the tomatoes and the pickles in a room with a lot of humidity and an ambient temperature of at least 100 Fahrenheit. Things should happen. Chop the beaver into small, edible pieces. Don't worry about skinning it or removing the entrails: those are the parts with the most nutrients and minerals. Even if the pelage proves a hassle to masticate and swallow, it will give you a longer time to enjoy your delicious meal. Pour the flour onto the floor and step on it; we don't actually need it for the ingredients, it just helps to keep you entertained while you cook. Did you really think Canadian fur-trading lumberjacks had access to flour when this recipe was made? On a table, roll the chopped beaver and aged garlic, tomatoes, and pickles together while making sure to get all the nice juices and mold from the pickles and tomatoes into the beaver along with the Castrol.® Place any leftover garlic mixture inside the beaver. Just squeeze it in as best you can, there is usually enough room behind the small intestine. Notice how the motor oil helps you accomplish the job. Turn the oven on to 400-6000 degrees Fahrenheit, it doesn't really matter what temperature, this part is just to add some crunchiness to your beaver. Wash a pan thoroughly, hit some random lad with it then put it away. Why bother getting it dirty with your cooking? 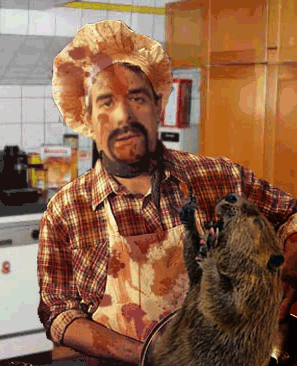 Just throw that beaver concoction into the oven and try not to watch what happens. Leave the beaver in the oven for around 5 hours. By then, the mind-controlling parasites that have grown in the tomatoes will have either died or not. We can't really say. Take the beaver out of the oven and place it on the table. Stare at it for 10 minutes. The beaver will either cool down or completely melt. Note: In the extreme case that the beaver turns green and starts glowing, immediately contact the nearest US military base and tell the operator "Code 42." You will then have 15 minutes to flee the city before the nuke lands. You certainly were wondering what the paint is for isn't it? Well, it's an accompanying beverage, of course! Remember that old saying: "A gallon of paint a day keeps the doctor away?" It may taste a little nasty at first, but every sensible person knows that anything that has a disgusting savor is actually good for you, so stop complaining and start getting healthier! Now that you've had time for prayers and childhood flashbacks, it's time to eat your tasty beaver. Take the pine gum you just collected from that tree. Never mind if it's really a pine or not, as long as it has some lubrifying properties. Even engine oil does the trick. Cover your meal with it, it makes it easier for the fur, bones and internal organs to slide down the hatch. It would be great to first verify that someone in your family knows the "Heimlich maneuver" before stuffing your faces. Remember to get in the spirit of those who pioneered this recipe, so drag the whole family to some shack in the woods and eat the delicious meal to the romantic light of a seal fat fueled lamp. In the extreme case you feel well enough to have dessert, may we suggest either a maple syrup drowned partridge or a moose antler soaked in strawberry jelly? Besides filling your stomach to the brink with borderline radioactive food, the dessert will ensure that your stomach will have enough time to digest the beaver concoction with acid. It's best if we don't tell you what might happen if the acid doesn't dissolve it in time. This article was nominated to become a featured article; however, due to several votes being devoured by a Wal'NTlet, it didn't make the cut (8/14). Don't let this happen again! For just pennies a day, you can prevent another travesty of this nature, or vote for other articles at Uncyclopedia:VFH. This page was last edited on 19 November 2012, at 11:23.